We know that the summer has arrived when our stanhopeas start to flower and we have buds swelling on several species. 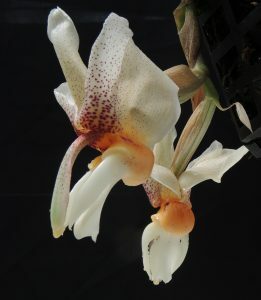 Stanhopea insignis is endemic to Brazil where it grows in warm lowland forests up to 500m and, like all stanhopeas, has large waxy fragrant flowers which only last a few days but are well worth waiting for. We grow all our stanhopeas in baskets to allow their pendulous flower spike to emerge and keep the baskets quite low in the greenhouse to make watering easier. 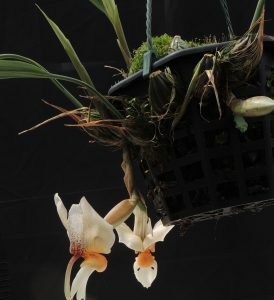 The moss in the basket shown here gives an indication of our heavy watering regime for plants and we find that the perfect place to hang a stanhopea basket is under a cattleya basket. This ensures that the cattleya is dryer and brighter and the stanhopea damper and more shaded.